It’s an odd thing to hear from someone so well known for walking around campus in his bare feet. Rob McCulloch has been hoofing it shoeless on (and off) Dalhousie for the past four years. He gestures to the bulging black sports bag lying beside him. The 23-year-old native of Glammis, Ont.—along with his size-15 feet—has been a fixture on the Dal track team since 2008. McCulloch competes in the pentathlon, a jack-of-all-trades event that combines hurdles, long jump, high jump, shot put and running. He was named the most valuable player at the AUS championship meet in his first three seasons, and this spring he was recognized as the conference’s athlete of the year. At last year’s Canadian Interuniversity Sport nationals he managed to win two medals—both bronze—in high jump and pentathlon. This year, for the added challenge, the 6-foot-6, 220-pound athlete decided to play volleyball as well. He describes McCulloch as an upbeat, outgoing guy. Certainly no one would accuse him of lacking drive. “Anyone who tells me I can’t, I tell them, ‘just watch me,’” McCulloch says. In 2011 McCulloch blew out his knee in the middle of nationals, tearing his meniscus while participating in the long jump event. Undeterred, McCulloch went on to complete the remaining three events, coming in fourth place and missing the medals by a mere three points (not a lot in a sport where a typical score is 3,500). 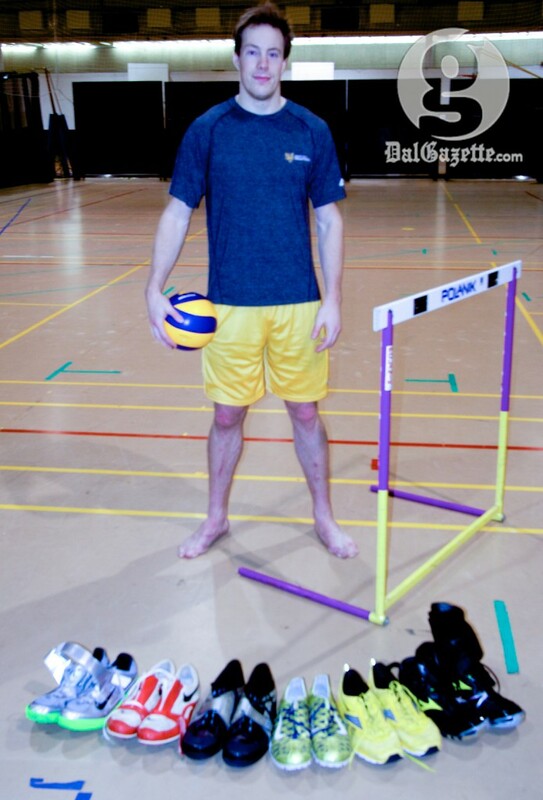 Simon Watts is another Dal track athlete who’s trained with McCulloch for the past four years. He describes his teammate as a dedicated worker. The youngest of four boys, McCulloch is a die-hard retro video game fan and an avid experimental cook. “I try to endorse my Christian values through all walks of my life,” he says. Around his neck are a chain and cross made of Australian silver. McCulloch can’t remember the last time he took them off. An Academic All-Canadian four years running, grades are also important to this student-athlete. And time management is key. McCulloch’s standard Tuesday runs 16 hours, involving a 6 a.m. wakeup, training for both track and volleyball, class, weights, stretching and eventually arriving back home around 10 p.m.
McCulloch technically completed his honours BSc in psychology last year, but he’s still taking classes at Dal in order to continue competing in university sports. McCulloch is uncertain what’s in store for him when he finishes at Dal after this year. Grad school and Bible college are both options he’s considering. For now, though, he’s happy to focus on balancing his routine. “I’ve been told that I’m crazy for doing what I’m doing,” he says. As for whether it’s worth it: McCulloch smiles.